Consumer activity accelerated in March as pent-up demand for retail goods was released following the colder-than-normal winter. The resurgence in spending is one of several indicators that the world’s largest economy is poised to break out this spring after a lackluster first quarter. Over the past two months, nearly 400,000 jobs have been created and jobless claims are close to pre-recession levels, trends that should fuel the economy growth in coming months. Annualized GDP growth is anticipated to accelerate to the mid-3 percent range in the second quarter, which will encourage the Fed to continue tapering the latest round of quantitative easing. Excluding autos and gas, retail sales climbed 1 percent in March, surprising to the upside. Receipts across nearly every category increased as consumers opened their wallets to make up for lost time. General merchandisers, building material stores, and food service and drinking retailers posted the largest increases among bricks-and-mortar stores. Non-store retailers, including Internet retailers, also recorded healthy gains, with sales jumping 1.7 percent. Only electronics and appliance stores, and gasoline stations faced weaker demand, losing 1.6 percent and 1.3 percent, respectively. Softening home sales pulled down big-ticket appliance purchases, while gasoline stations face increased competition from drugstores. 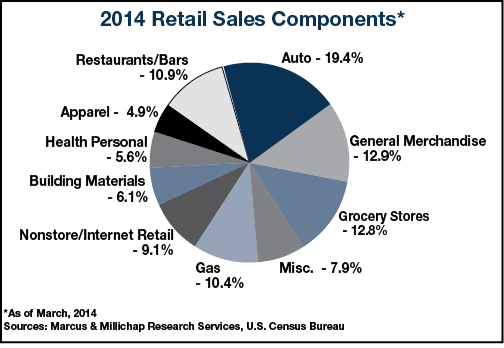 Although auto sales are excluded from core retail sales, they are indicative of consumers’ outlook. In March, consumer confidence reached a six-year high fueled by the future outlook component. The major auto manufacturers posted impressive growth during February and March, boding well for the broader economy. The pace of auto sales surged to an annualized 16.3 million units in March, up from 15.3 million during February. The Big Three, Toyota and Nissan all surpassed expectations during the month. Retail sales are well above pre-recession levels, both in absolute terms and on a per-capita basis. However, retail sales gains have yet to translate into occupancy at smaller retail centers due to the supply overhang that many metros still face. Many of these smaller retail centers are dependent upon local businesses to fill their space. As consumption accelerates and demand intensifies this year, particularly in outlying suburbs, leasing activity is anticipated to accelerate and fill much of the dark in-line space still on the market. The industrial sector is largely dependent on consumer spending, particularly with the growth of online shopping. Since the beginning of the recession, online retailers have picked up an average of 1 percent of total retail sales each year. Internet retailers continue to seek local space to support faster delivery models. As a result, industrial vacancy finished 2013 at the pre-recession level and is anticipated to decline 100 basis points this year to 7.2 percent than backfilling empty cubes. As office users seek space in secondary office districts, nearby retailers should finally enjoy foot traffic on par with pre-recession levels. This entry was written by marcusmillichap, posted on April 23, 2014 at 8:34 pm, filed under Research and tagged Commercial Real Estate. Bookmark the permalink. Follow any comments here with the RSS feed for this post. Post a comment or leave a trackback: Trackback URL.